Home Blog New Mobile Website! 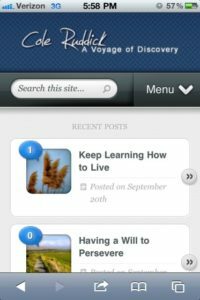 The Voyage of Discovery website has seen a few renovations over the past couple of years…and today comes the official launch of the latest improvement. The goal is ultimately, being able to access & use the website as easily as possible from anywhere, but the last face-lift that the site had made it load pretty slowly for anyone using a mobile browser. ColeRuddick.com now uses a new theme with mobile-optimized technology for anyone who visits the site from an iPhone, Android, Blackberry or Windows mobile platforms. It’s simple, very fast and easy to read. The theme is automatically detected & you won’t see it unless you’re using a mobile browser. Visitors can comment on posts just like on the full website, as well as access RSS feeds, search the site & view a complete menu through the mobile version. If you haven’t already tried it, give the mobile website a spin by going to http://ColeRuddick.com using your smartphone. Bookmark it while you’re at it! Let me know how you like it or if you experience any problems by leaving a comment, below.